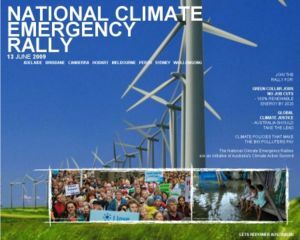 National Climate Emergency rallies were held across Australia on Saturday June 13, 2009. Over 4,000 people attended the rally in Melbourne, Australia, which commenced at the State Library in Swanston Street. 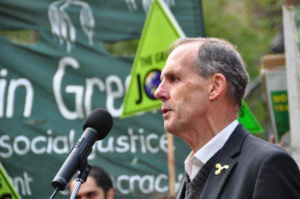 The rally was called to acknowledge the climate emergency we are now experiencing and the need emergency action, with drought, bush fires, floods and rising seas are already hitting hard. The recession and climate change can be tackled together through direct investment in renewable energy to create jobs, stimulate the economy and begin to create the carbon-free economy of the future. 100% renewable energy by 2020. Australia must make the shift from fossil fuels to 100% renewable energy from wind, solar and other available technologies. Green collar jobs not job cuts. We can renew our economy by creating hundreds of thousands of 'green jobs' and supporting workers to make a fair and just transition to sustainable industries. Don't pass the Carbon Pollution law. We need climate policies that make the big polluters pay and not allow big companies to go on polluting. The CPRS won't reduce Australia's greenhouse pollution. Logging and clearing vegetation are major contributors to climate change as forests and woodlands are important carbon stores. "wealthy countries' targets to cut greenhouse emissions fall well short of what is needed to avoid catastrophic climate change"
"The informal note by the UN climate change secretariat dated June 6 estimates current pledges add up to a total emissions cut by the rich of between 16 and 24 per cent below 1990 levels by 2020." "Conservative estimates suggest rich countries must make a cut of 25-40 per cent to give the world a chance of avoiding a 2 degree temperature rise — seen as the trigger for climatic changes leading to widespread water shortages, displacement of people, species extinction and the loss of landmarks such as the Great Barrier Reef." Speakers condemned the Government's emissions trading scheme as inadequate and accused the Government of selling out to heavily polluting industries. protecting Australian forests from logging to keep the carbon they store safe. funding for energy efficiency measures and increased public transport. The protesters marched down Swanston Street and sat down outside the Melbourne Town Hall, where the Victorian Labor Party's state conference was in progress, then continued up Collins Street to the Treasury Gardens. Minister for Climate Change Penny Wong attempted to defend the Rudd Government's CPRS by claiming that the government "this Government does want to take action on climate change," and that "What many of these people are calling for simply can't be done. It can't be done while supporting jobs" Senator Wong appears to have missed the central point of the rallies that thousands of clean energy jobs can be created to lower carbon emissions and tackle climate change. 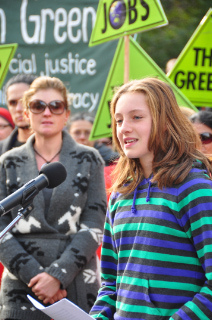 "Yesterday, thousands of Australians called on the Federal Government to drop its carbon pollution legislation and start large-scale investment in renewable energy. Here's why. We are in a climate emergency, which demands emergency action. The speed and severity of global warming is exceeding even the worst predictions, leading many to suggest that greenhouse gas levels are already too high." 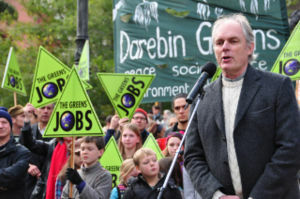 David Spratt, author of Climate Code Red, speaking at the Melbourne rally. 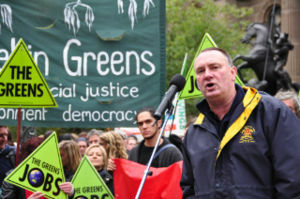 Damien Lawson, National Climate Justice Co-ordinator with Friends of the Earth, addressing the crowd outside the ALP State Conference, Melbourne Town Hall. Sitdown protest outside Melbourne Town Hall; Speech by Emeretta Cross from Tuvalu. Treasury Gardens speech by Teagan Edwards from Yarra Climate Action Now on the need for joining or starting local climate action groups. This page was last modified 08:39, 18 June 2009. This page has been accessed 55,944 times.